Norman S. MacKinlay, a gift from his mother in 1875. Ansdell was first introduced to Scotland by the Earl of Sefton, whom he accompanied on shooting parties. A love of Scotland remained with him throughout his life, and he eventually built a lodge on the shores of Loch Laggan where he would stay each summer for at least four months, closing his house in Kensington and taking his family and staff with him. Owing to the length of his stay he was able to practice some sheep farming, and accompany the shepherds in their daily round. This gave him ample opportunity to study those animals he liked painting most: sheep and dogs. Dated 1861, this painting comes from the period when Ansdell's output of Scottish pictures was at its height. 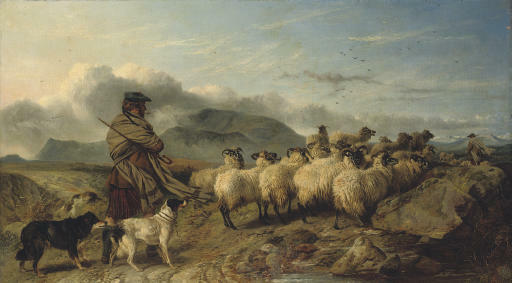 The scene is clearly taken from life, and includes the same shepherd and his two dogs who appear in other pictures of the period. The sheep are individually characterised, as they are herded across the rough terrain in hostile weather. The wind catches the shepherd's woollen shawl: his pipe and the fact that he is not alone are his only comforts. Ansdell has juxtaposed the figure against the skyline - a favourite technique that lends drama to the composition. All the artist's favourite elements are incorporated and lovingly described: the peaty puddle and lichen encrusted rocks with misty mountains threatening rain beyond. The urban viewer is reminded of the intensity with which one engages with the elements, and how sensations are heightened in the rigorous Highland landscape. We are grateful to Sarah Kellam (née Ansdell) for her help in preparing this catalogue entry. Sarah is currently compiling a catalogue raisonné of the artist's work. She can be contacted at www.richardansdell.co.uk.